June 12, 2018, Hefei. 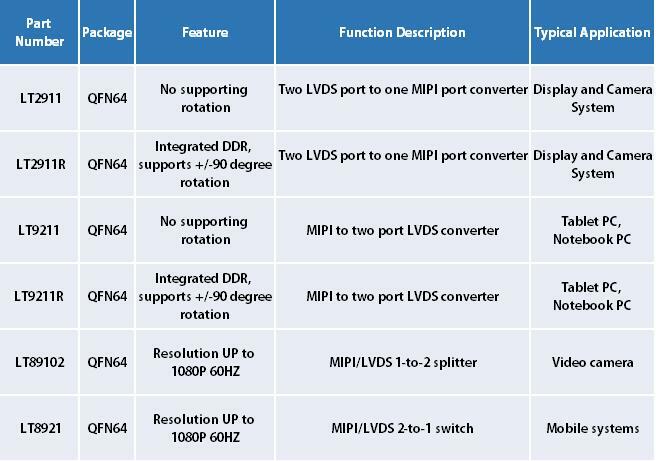 Lontium introduced a new series of MIPI and LVDS conversion, switch and splitter shipset, providing a complete solution for small and mid-sized panel interfance applications. LT2911R is two LVDS port to one MIPI port convert with +/-90 degree rotation function to fit landscape display applications. LT9211R is the opposite, it provide MIPI to two port LVDS conversion with +/- 90 degree rotation. LT89102 is a MIPI/LVDS 1-to-2 splitter, and LT8921 is a MIPI/LVDS 2-to-1 switch. See below table for a more detailed list of this product series. All parts in the list are in production with L/T of 8 weeks. For more information and sample/technical support, please contact your local Lontium distributor.